Bone has the natural ability to remodel and repair. Fractures and small noncritical size bone defects undergo regenerative healing via coordinated concurrent development of skeletal and vascular elements in a soft cartilage callus environment. Within this environment bone regeneration recapitulates many of the same cellular and molecular mechanisms that form embryonic bone. Angiogenesis is intimately involved with embryonic bone formation and with both endochondral and intramembranous bone formation in differentiated bone. 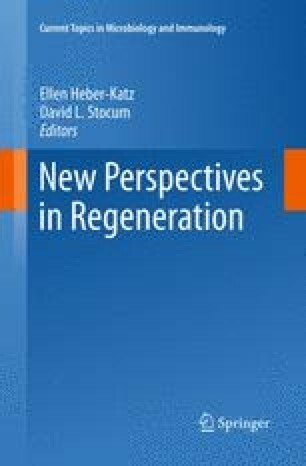 During bone regeneration osteogenic cells are first associated with vascular tissue in the adjacent periosteal space or the adjacent injured marrow cavity that houses endosteal blood vessels. Critical size bone defects cannot heal without the assistance of therapeutic aids or materials designed to encourage bone regeneration. We discuss the prospects for using synthetic hydrogels in a bioengineering approach to repair critical size bone defects. Hydrogel scaffolds can be designed and fabricated to potentially trigger the same bone morphogenetic cascade that heals bone fractures and noncritical size defects naturally. Lastly, we introduce adult Xenopus laevis hind limb as a novel small animal model system for bone regeneration research. Xenopus hind limbs have been used successfully to screen promising scaffolds designed to heal critical size bone defects. We gratefully acknowledge support of the National Science Foundation (IJ, NF, JC). A special thank you is due to Heidi Richter of Precision Graphics, Champaign IL, for creating the illustrations for Figs. 1 and 2.